Detail showing Bethnal Green from Bowles' folding map of London of 1731. This is a later edition of the map first issued by Bowles in 1719 extended to include Stepney and the Isle of Dogs. 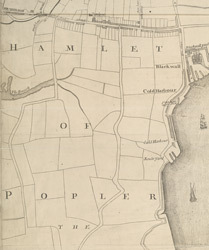 Bowles based this part of the map on Gascoigne's Survey of Stepney of 1703.